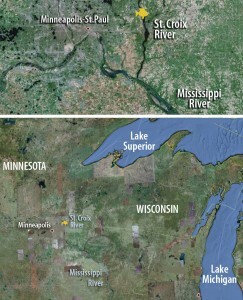 A number of small rivers in between the St. Croix River and Lake Superior are wetlands areas and prone to flooding, which the Army Corps of Engineers identified as pathways to the lakes. Click to enlarge. 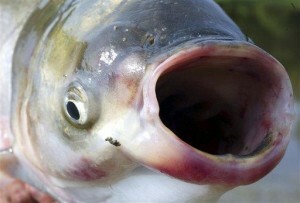 Asian carp may be a hop, skip and jump from infiltrating the Great Lakes through Minnesota waterways. Genetic testing turned up 22 positive hits for silver carp 50 miles upstream of the St. Croix River, a tributary of the Mississippi River, according to test results released late Thursday by Minnesota officials. Two obstacles prevent carp from entering Lake Superior: the St. Anthony Falls Dam and Lock and Dam 1, also known as the Ford Dam, near Minneapolis. An angler fished a bighead carp out of the St. Croix River last April. No actual carp were found in the latest round of testing by the National Park Service. But results imply there’s likely a heavy concentration of the silver jumpers in that area, said Trilby Becker, water policy coordinator for the National Wildlife Federation. Officials have concentrated efforts to stop Asian carp from entering the Great Lakes in the Chicago Area Waterways System. That region is the focus of political and legal disputes over closing the waterway. But the U.S. Army Corps of Engineers has also identified 30 potential carp pathways in other states. Two northern Minnesota waterways in the Mississippi River watershed are acute pathways: the Swan River and its tributary. Both are susceptible to flooding. The monster fish with prodigious appetites are known to vacuum up food needed by native fish. The state must stop Asian carp – a catch-all term for several non-native species – before they negatively impact the state’s waterways, Becker said. “We must intervene at the downstream point that permits the greatest opportunity to prevent Asian carp access to up-stream water-sheds immediately,” David Zentner, national director of Minnesota’s chapter of the Izaak Walton League of America, said in a prepared statement. An informal Asian carp taskforce of state and federal officials will meet early Friday to discuss the recent developments and coordinate their efforts. One solution of halting the carp may be to close the two dams. Lock and Dam 1 (Ford Dam) in Minneapolis, Minn. Some environmental organizations are asking officials to consider closing this dam and the St. Anthony Falls dam to prevent Asian carp from spreading past the Twin Cities. *Editor’s Note: This story was updated Aug. 12 at 12:45 p.m. with a map of Asian carp advancement and video. Nobody has predators for 40 to 100 pound carp. But we have several for the eggs, fry and juvenile asian carp. Perch would be our best bet, they could feed on them most of the first year, then Walleyes, Pike expand that to almost 2 years of growth give or take. Control the spawn control the fish. This is what invasives do to native fish disrupt the spawn, either by starvation or predation. Google “common carp control using native predators” principle same. Lack of predators allows invasives to thrive, this is our fault, overfishing mostly. We have no choice but to attack them when small, predators our best bet. I quote one study “stocking of predator species is ESSENTIAL to control numbers of young carp” :a dense predator base should be maintained to provide a high level of predation on young carp” pretty simple really. Tom Matych, what native fish eats 40-100 lb carp? And even if all of our walleye, trout, and salmon could eat these 3 ft long fish, how do you propose forcing them to move south to the ocean, slaughting Asian carp along the way? They are arguing about the Chicago Ship Canals and these Asian Carp sneak in the back door through Minnesota! I agree with Tom, flush them back!. They also need to block or do something with identified 30 potential carp pathways in other states. Close the lakes gates! Donald Short, Tomato Plants . Here’s a thought. Since we have billions of Asian Carp spread across the south heading North like a forest fire. Why not set a backfire or the northern states get together and restore native predators heading south. Flush them back to the sea if you will.